Below are the basics of the hearing and what you can expect from the day. WHAT: A public hearing regarding the toll road through San Onofre State Beach. Throngs of toll road opponents gathering to ensure the Federal Government upholds the decision made by the California Coastal Commission--no toll roads through state parks! WHEN: Monday September 22, 2008. The hearing is from 10:30am-8:30pm. Of course, we would like everyone to attend all day (take a sick day, like the rest of us: ) or come for at least a few hours. 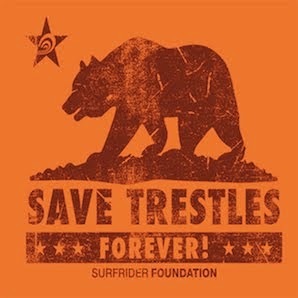 Surfrider, and our partners, will be providing supporters with tee shirts and other goodies (first come, first served). We will have food coupons to distribute to those who sign in at the welcome booth. Since we are a nonprofit, it's hard to feed everyone huge meals, but we do want to make sure that our supporters are taken care of and have sustained energy to be at the hearing all day. Upon arriving, please check in at the welcome booth to receive your tee shirts and food coupons. Please note the following agenda is a rough estimate. • 10:30am-1:30pm: Testimony from Elected Officials. There are several outstanding elected officials speaking on our behalf including Bobby Shriver, Donna Frye, Bill Lockyer and others. • 1:30pm-2pm: Testimony from Organizations. Surfrider Foundation and other interesting organizations will be heard during the next few hours. • 2:00-2:30: Official Hearing Break. We are having a rally in the pavilion area behind O'Brien hallcome and learn more about how the day will go and what to expect. • 2:30-5:00: Continued Testimony from Organizations and Native American Tribes. • 5:00-5:30: Official Hearing Break. Please be sure to visit our letter writing station during the break. We want to fill the drop boxes with letters opposing the toll road. • 5:30-8:30: During this time, organizations will finish speaking and the general public will begin testimony. It's challenging to say exactly what time the general public will speak. As you know, not everyone from the public will be able to speak since the meeting ends exactly at 8:30pm. See the list of speakers below. • 8:30pm-9pm: Meet us outside of the O'Brien hall as we gather to celebrate our efforts, enjoy acoustic music, and listen to special guest speakers. Recognized singer-songwriter Steve Ybarra will play music which has been featured on radio and television across the country. Shaun Tomson, World Champion Surfer, will be our featured guest speaker. Upon listening to Shaun, we will hear from prominent environmental leaders. As you know, there will not be a decision made at the hearing, so it's important that we come together to ‘celebrate our efforts of the day' and begin to look forward! We expect the Federal Government will make their decision by then end of the fall/early winter. View list of speakers: click here If you plan to drive yourself please note that the Del Mar Fairgrounds charges $9 for parking. Check out carpool belwo. Please pass this around to everyone who cares about protecting our State Parks! We need thousands of people to attend! Any word on food this time around? I'm probably going to have to drive myself in and pay the $9 ... but I'm sure I'm not the only one that is wondering about sustenance. sorry.. I just re-read the blog.. coupons at the booth for those of us in it for the day.. got it. This is so great, we will be coming up with your Baja support group. Just hope that Dedina is not going to speak. In addition, we have no faith in Ben Hueso, the entire Mexican community here is alarmed and upset over his fabricated accusations which he made last year and we only just found out about two days ago. His statements as appeared in Cafe San Diego are without merit, no pictures and no scientific testing, it is shameful. The Mexican Nationals in this community work night and day with the city of TJ and CESPE cleaning the baranca, providing erosion control and testing the runoff, they are outraged over Dedina and Hueso, and so am I. He owes SADM and the city of TJ a huge apology, and I for one, after reading his lies will never trust him, ever. Sorry, I know this should not be the platform for this topic, but Hueso has been appointed to the Coastal Commission, so thought you should be aware. Why is there a webcast for the contest but not for the hearing? It's a bummer that some of these sponsors couldn't see past their current earnings to their future potential losses.